This is the first frame of the opening animation. 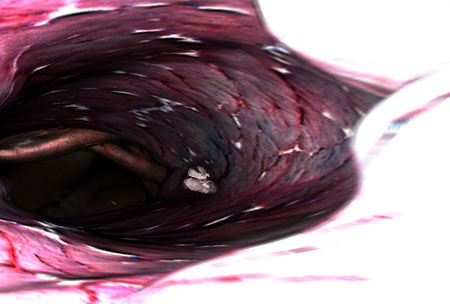 The fetus and umbilical cord are visible at the end of the tunnel. To start my texture mapping, I surprised some people in my office, who know that I am a vegetarian, by buying a large steak. 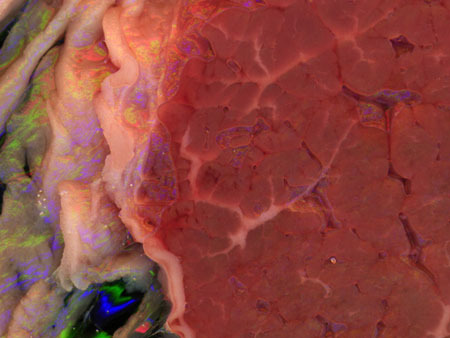 I spread out the raw beef on the glass of my scanner, scanned at 600DPI, and manipulated it in Photoshop into some wonderful self-tiling texture maps. This tube we fly through has the digitized beef texture on the walls, rippling from an animated displacement map. The scanning process was an extremely satisfying one. Pressing the dripping flesh into the clean putty-colored-plastic computer system sort of symbolized everything I'm trying to with graphics: to make images that sully the super-sanitized plastic and glossiness that recur as a cliche in computer animation. The amniotic fluid is partly built up by little patches floating around the character, which were transparency mapped with images of sauerkraut that I also sprinkled directly onto the glass of my flatbed scanner. You can see a piece of sauerkraut floating in the center of the image.